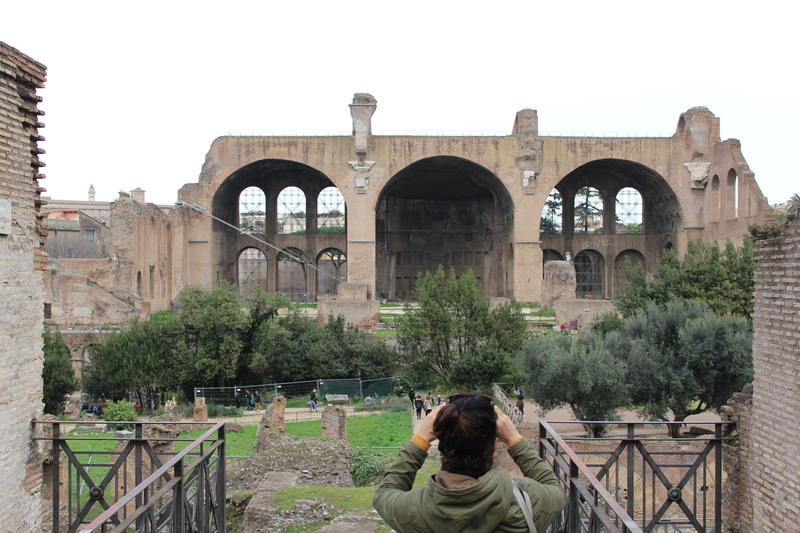 How Do You Make Summer Internship a Reality as an International Student at Hope College? Internships are part of the college experience for many students. A lot of students do not start to think about it until later in their college careers, so it is unique for me, since I am only a freshman. At least that’s what the Career Development Center said when entered their office in October 2015. Nevertheless, here is what does it take to make a summer internship a reality from the international student standpoint. All international students studying in the United States are on a student F-1 Visa, which strictly disallows work outside of campus. This is because the primary purpose of the student is to study, not to work, which make sense, but it just makes things complicated for international students. So in order to have summer internship outside college campus, the international students need to plan the internship through school and make it part of a class or/and major requirement. Firstly, students need to declare a major. Without declaring a major, international students are unable to “connect” the internship to a school experience. When the student declares a major, one gets a adviser. Secondly, the adviser within the major helps the student pick the summer internship class. Also, this adviser is the college official that evaluates and grades student’s work. Thirdly, the international student gets one page CPT (Curricular Practical Training)* from from the International Office. The student fills it out together with the academic adviser. Next, the student registers for summer internship class, ranging from 1-4 credits. Lastly, the company or firm sends a letter confirming details of the student´s employment, which is required with as part of CPT form. So when student gets the letter, one turns it in together with the CPT form to the international student office. And there you go. Internship is all set up. Sukumar, Raghuram. “What Is the Difference Between OPT and CPT?” Happy Schools. Happy Schools, 13 Nov. 2014. Web. 14 Apr. 2016. 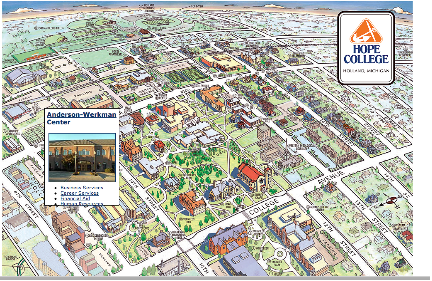 Posted on April 14, 2016 April 16, 2016 Author Jakub MyskaCategories AdmissionsTags internshipsLeave a comment on How Do You Make Summer Internship a Reality as an International Student at Hope College? 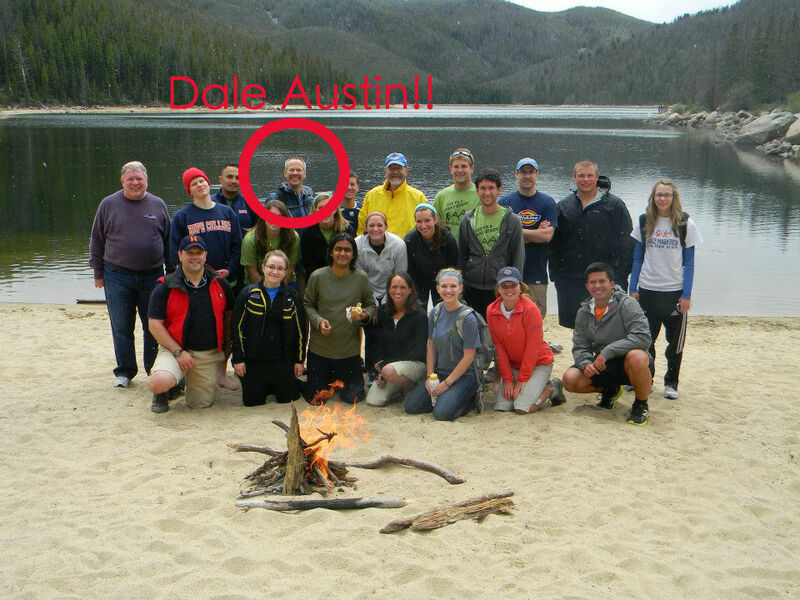 Dale Austin is one of the coolest people ever. Have you met him? I’m sure you’ve seen him walking around campus, taking someone out to lunch at the Kletz, or strolling through the Pine Grove. I met Dale on my excursion to Gainey Ranch, as he was one of the many professors and staff from Hope chosen to come along. Introducing himself to the group, he said his title at Hope was “Director of the Career Development Center.” I’ll admit, I had no idea what that was. Sure, I’d heard of students going there for career assessments, but I thought it was majorly geared towards graduating seniors, alumni seeking jobs, and entrepreneurs. I could have never been so wrong. Checking out the Career Development Center, which is located in the Anderson-Werkman Building (see above), was completely eye opening. They can assist students with literally EVERYTHING. First, Amy Freehafer can help you explore whatever it is you could ever dream of doing. She’ll help you identify your strengths, find classes that match your interests, careers that you could be interested in, and she’ll even make a four-year plan. For anyone. Did you read correctly? A FOUR-YEAR PLAN. Pre-Med majors, put your pencils down and stop trying to figure out how all five labs will fit into your one year. Amy has got you covered. Are you worried about that personal statement because you don’t know what assets you could bring to the job? TAKE THE STRENGTHS FINDER WITH AMY. Then, there’s Jena Szatkowski. She’s the master of all things social media, speed networking, and externships. What is an externship you ask? Externships are extended job shadow experiences of 2 to 5 days with alumni and friends of the college in a profession related to a student’s goals. They are the coolest new things in the realm of career exploration and preparation. Why don’t you check out what Danielle Portfleet did last year during May Term…. She was paired up with a Hope alumni that happens to be the vice president and managing director of the Latin American branch of Harley-Davidson. She spent a few days in May checking out three different Harley locations and learning best business practices. Jena also can help you create alumni contacts in any field. There are over 3000 alumni that are very willing to share their occupation with you, whether it be a quick phone call conversation or over coffee. Where there are resources, there are opportunities. Many of these externships and connections end up very useful in interviews and job searches. 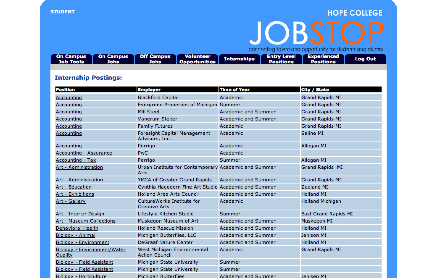 Have you been to Hope College’s JobStop website? (This can only be accessed by Hope students). It has tons of internships, volunteer opportunities, and jobs for on and off campus (whether you are experienced or entry-level). Sarah McCoy is the queen of internships. 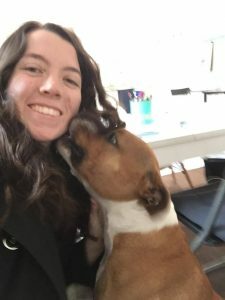 Whether it’s finding an internship, contacting corporations about opportunities or applying, Sarah has got the connections. These internships can count for credit or in some cases be paid positions! Check out some of the internships that Hope students have participated in here. And of course — DALE! As the director and having worked at the Hope Career office for more than thirty years, Dale focuses most on seniors deciding their next step in life. A lot of this is preparation. You can sign up for a mock interview where Dale will do a professional interview with you and provide constructive feedback to help you really get the job! The community and mission of Hope have kept me here; and the opportunity to create programs and initiatives that make an impact on students’ lives and futures! [The] best part: a combination of the great relationships developed with students, faculty and staff and the opportunity to develop programs to help foster the career development of Hope students! Need to spruce up your resume? You can do it from your couch with Optimal Resume. Just send in your draft and a CDC advisor will go over it and send you feedback on how to improve it! After a series of constructive reworkings, you’ll have a perfectly polished and directed resume.Sarah McCoy is the queen of internships. Attend a Career Panel. The CDC sets up many throughout the semester. Check out their upcoming events on their website. Visit their Resource Library, located in the main office where there are tons of book guides to interviews, internships, career exploration, and more. There are books for dance majors, masters of foreign languages, athletes, pre-professionals, nursing, literally everything. Keep a close eye on the Career Development Facebook page. They have job and internship postings, witty advice, and tons of great images including my absolute favorite one (see left!) haha! So…What are you waiting for? 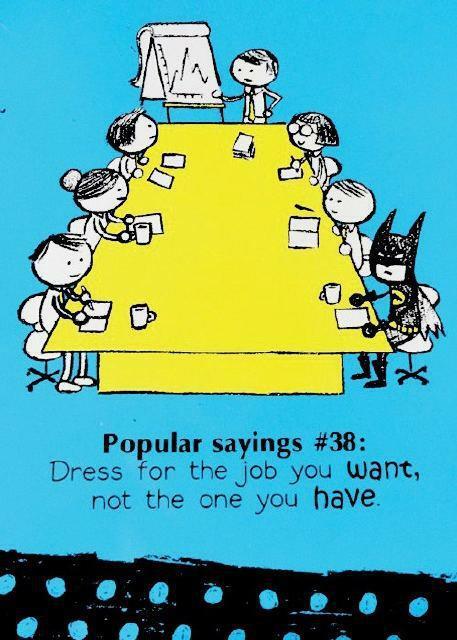 Call up the Career Development Center at 616-395-7950 and introduce yourself to the team!